In which a recruit’s name is plugged into Google and the bits of information that trickle out–guru ratings, newspaper profiles, YouTube highlights, all that stuff–are synthesized in the hopes of getting a clearer picture of the player we’ll see at Auburn next fall. Previously: Jessel Curry, Craig Sanders, Roszell Gayden, Brandon Mosley, Demetruce McNeal, Jake Holland, Shaun Kitchens, Cody Parkey, Cameron Newton, and Joel Bonomolo. Look at him. You're glad he's on our team, aren't you? You don’t have to follow recruiting all that closely to know that Auburn’s in-state recruiting the previous two years hasn’t even quite measured up to “lackluster.” Auburn hasn’t a signed a prospect in the Rivals’ Alabama top 10 since 2007, signed just one of last year’s Super Seniors, etc. There’s a reason the Auburn staff spent part of the summer touring the state’s high schools in a limo. Owens represented a golden opportunity to end that streak–he’s got deep Auburn ties (it’s impossible to read a piece about him that doesn’t mention them), he plays a position where Auburn can offer immediate playing time, he came away from Big Cat Weekend raving and had Auburn listed as his leader throughout virtually the entire summer. If Chizik and Co. were going to be able to claim any kind of actual victory in their stepped up in-state recruiting efforts, Owens was a recruit they simply could not lose. Even as more and more even-more-decorated recruits gave Gene Chizik their pledge and eventually signed on Auburn’s dotted line, I still felt the same way: Owens was the single most important recruit in the class of 2010. Auburn could talk all they wanted about re-establishing their presence in Alabama, about challenging whoever they wanted to challenge in recruiting, about returning the talent foundation to the solidity of the late ’80s and mid-Aughts. Without Owens, honestly, it’d be nothing but talk. But they got him. And that, for my money, is where the class of 2010–as the impact class it would eventually become–really, really began to come together. HIGH SCHOOL: Named an All-American, the No. 7 linebacker and the No. 4 player in Alabama by SuperPrep … Named to the PrepStar All-American team … 2009 EA SPORTS Third-Team All-American … Was a participant in the 2010 Under Armour All-American game … Was a 2009 Alabama-Mississippi All-Star game participant and had two sacks in the game … Was an honorable mention selection to the Class 6A All-State Team by the Alabama Sports Writers Association as a senior and junior … Ranked No. 4 on the Mobile Press Register’s 2009 Elite 18 … No. 13 on the Birmingham News’ list of the Alabama Super Seniors … No. 46 on the Mobile Press Register’s Super Southeast 120 … Honorable mention member of the Orlando Sentinel’s 2009 All-Southern football team … Finished senior season with 80 tackles, 20.5 sacks and two forced fumbles … Recorded 92 tackles and 18 sacks as a junior. PERSONAL: Born Sept. 18, 1991 … Son of Ora Owens … Uncle James Owens was the first black scholarship football player at Auburn. — Given Auburn’s issues on the linebacking depth chart, there doesn’t seem to be much chatter about Owens possibly moving to defensive end … but goshamighty, 20.5 sacks (38.5 in two years) and two more against the increased competition of the MS/AL All-Star game? If guys like Jessel Curry and Jawara White exceed expectations and the ends like Corey Lemonier and Craig Sanders fall below them–not likely, on the latter count, but still–you know Roof is going to think about having a player with this kind of pass-rushing talent put his hand on the ground. Owens might also make a 3-4 look awfully tempting. — Then again, at 225 pounds, he’s obviously most likely to stick at linebacker … where he’s already got NFLish size, 4.5 speed, and clearly a ton of potential as a strongside blitzer. — Dude, 20.5 sacks and he’s still only honorable mention All-State? The hell? — It’s already a great story to have the nephew of Auburn’s first black scholarship player on scholarship at Auburn. Here’s to hoping Owens shines enough over the next few years that we can revisit this in the future … when it’s an even better story. RECRUITNIK HOO-HA: It’s nothing but good news here. You get a sense of the acclamation for Owens in the bio above–thanks, Newspaper Dudes!–but it’s no different with the Internet gurus. Most Impressive: He is very physical at the point of attack and does a nice job of diagnosing pass or run. Owens is also relentless in his pursuit of the football. Conclusion: His nose for the ball and physical tools will take him a long way. If he can adjust to playing linebacker, he has the potential to be a multiple year starter with all-conference potential. Owens played throughout his high school career with his hand on the ground. He is a very athletic defender with great speed. He is aggressive and has excelled rushing the quarterback. He’ll do well chasing down players in the backfield and running sideline-to-sideline once he learns the new position on the next level. Does say Owens needs to work on pass coverage skills, but nobody’s perfect. Owens is a bit of tweener outside linebacker/defensive end, but a very talented prospect from a physical standpoint. Has smaller size if projected as an end, but has a longer wingspan/frame and is really well-built and put-together … Shows good short-area power and explosiveness jolting blockers back at the point of attack and separating. Very difficult to seal off with his good blend of quickness, power and body length on the edge. Excels as a pass-rusher. Works half the blocker’s body, keeps good separation and can get under the blocker’s pads and bend … Shows good backside chase speed and range making outside linebacker — particularly in a 3-4 — a good possibility. Strong, high-impact tackler … Marginal coverage skills are a concern. Shows good short-area re-direction skills, but hips can appear stiff in space and displays wasted motion opening to turn and pursue or get back in coverage … may have difficulty playing on the outside in a prototypical 4-3 defense. That said, Owens can close on the football and cover a lot of ground with his good length, motor and straight-line acceleration. May develop into a strongside linebacker with some polish and put his hand on the ground on third down. A tweener, but should offer his future defensive coordinator great scheme versatility and a disruptive presence on the edge at either end or outside linebacker. Great upside; a defender with a lot of room for both physical and positional development. OK, so maybe he’s never going to be Craig Stevens in terms of coverage, but who cares when there’s this much athletic potential to work with on the strongside. How much potential? 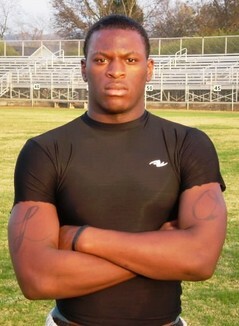 Offers included ‘Bama, LSU, Florida St., Tennessee, Clemson, both Mississippi schools, Arkansas, etc. And there was the Under Armour invite. Like I said: nothing but positives from the recruitnik perspective. Uh, yes, LaDarius Owens is strong. And fast. He never hit the weights until this winter. He never got any meaningful varsity football snaps until last season – which was at his fifth high school. His position? Jess Lanier’s coaches tried him at quarterback, linebacker, receiver and running back before depth woes moved him to defensive end. His desire? Despite itching to play after missing his sophomore season, he quit during a practice last season. But those facts are feints. The same way he’d get an offensive tackle leaning the wrong way. Owens had at least 18 sacks and 92 tackles last year in his first varsity season. How could a novice who’d never shook hands with a college coach until late last year do that? It was due to speed and athleticism that should not belong to a 6-foot-3, 228-pound defensive end. He clocked 4.5 seconds in his most recent 40-yard dash. His last measured vertical jump was 37 inches. Commence salivating. There’s plenty more from that story, an excellent profile by Jeff Sentell for the Super Seniors series that touches on James, his mother Ora, his rocky start at Jess Lanier, and more. It’s been a long, tough road for Owens to Auburn. You have to read it. ESPN posted a “behind the scenes” video Owens shot at the Under Armour game you can see here; highlight is some mild smack talk between Owens and ‘Bama commit Demarcus Milliner. Bessemer City linebacker LaDarius Owens woke up this morning and starting thinking about his future. Then he started texting. The Auburn commitment sent out text messages to about “16 or 17” future Tigers he’d gotten close to during the recruiting process. Owens said both he and Pelham’s Jake Holland have been praised by Auburn coach Gene Chizik for their skills as linebacker prospects and recruiters. According to the article Owens even tried to have all four Birmingham-area Auburn signees (Holland, Chris Evans, Jeremy Richardson, and Owens) sign in the same location on Signing Day, but it didn’t work out. “I’m going home,” Owens said. “I’m going to Auburn. Honestly, it’s been on my mind for a while. I just had to follow my heart. Ever since my season started, I haven’t had peace of mind for some reason. I think it’s just time to get it over with. It’s been fun and I’m grateful to be in this situation, but I’m going home where I’ll be happy.”Owens is Auburn’s 16th commitment. He is the fourth Under Armour All-American to choose the Tigers. He gave his chief recruiter, safeties coach Tommy Thigpen, the news Saturday morning. WHAT CONCLUSIONS WE CAN DRAW, IF ANY: There’s not really any doubt about Owens having the athletic chops to succeed in the SEC, I don’t think. Every guru and just about every coach who’s had a look at him has agreed, yes, this is a kid who can play at the level at which Auburn needs him to play. The only question is how best to put those gifts to use. I don’t want to dismiss the scouting reports that suggest Owens could have a rocky transition to linebacker in a 4-3; it wouldn’t surprise me if Owens took a redshirt year, despite his formidable reputation, as he adjusted to his coverage and scheme-reading responsibilities. But sooner or later, he’ll very, very likely be a force. C’mon: a linebacking specialist like Ted Roof won’t be able to figure out what to do with a wrecking ball like Owens? Especially a wrecking ball with Owens’ kind of motor? It’s not happening. Eventually, he’ll take over the strongside, and when he does, I’m guessing it’ll go badly for anyone who tries to run in his direction or keep him out of the backfield on passing downs. *We should probably take a moment to talk about spelling, since it’s kind of confusing; LaDarius Owens spells it with a capital D and no o in the final syllable, but Ladarious Phillips spells it with a lower-case d and an o before the u. Yes, at the end of this year’s “Google surveys …” series, there will be a quiz. Great mashup of clips, quotes, and links. Not a lot of mention of it here, but the guys seems to be a solid person too. Thanks, Justin. You’re right, he does. Guess I could have made more of it.